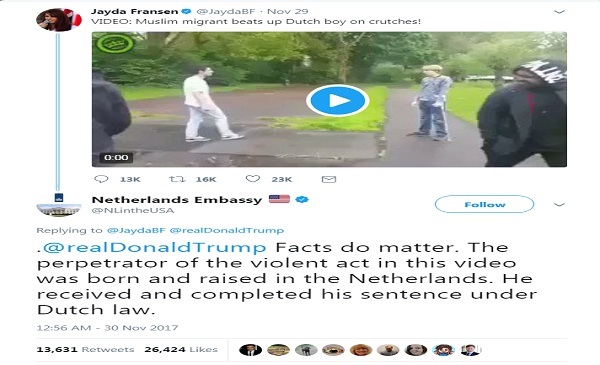 ‘Fact do matter’ the Dutch embassy in the US tells Donald Trump after the US president retweets a video with misleading text. U.S. President Donald Trump retweeted three anti-Muslim videos posted by the deputy leader of a far-right group in Britain on Wednesday causing a tweet storm. Trump, who has 43.6 million followers on Twitter, retweeted the videos shared by Jayda Fransen, deputy leader of right-wing group Britain First, without comment. One of the videos showed a group of Islamists pushing two boys off a ledge on to a terrace. The second video shows a Muslim man destroying a statue of the Virgin Mary. 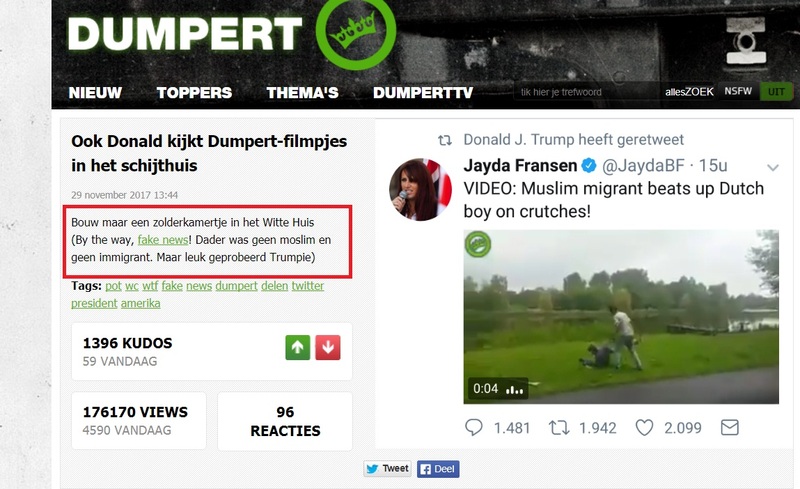 While the third video claims to show a Muslim immigrant assaulting a Dutch boy on crutches. Each of Trump’s three retweets attracted a flood of comments from people across the world criticizing the president for sharing such inflammatory videos while far right supporters in the U.S. and Britain defended the tweets. But it was the third video that really undermined the president’s argument and highlighted how fake news can permeate even the most powerful office in the world. The Netherlands embassy in the United States tagged the president in its reply and said ‘facts do matter’. “The perpetrator of the violent act in this video was born and raised in the Netherlands. He received and completed his sentence under Dutch law,” the embassy tweeted. 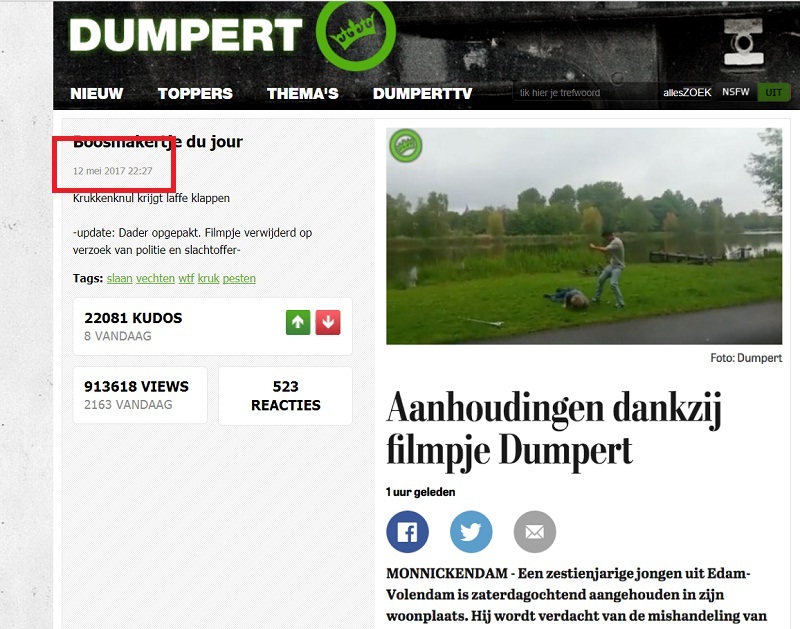 The video was first posted by Dutch video portal Dumpert in May. The site wrote a story mocking Trump for retweeting the video and further stated that the assailant in the video was neither a Muslim nor was he an immigrant. 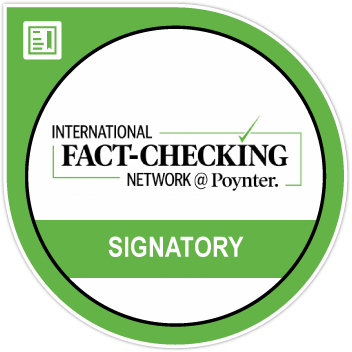 U.S. fact-checking website Snopes stated that a news report from the Telegraaf identified the attacker as a 16-year-old boy from Monnickendam. The report did not mention of the boy’s religion, Snopes said. The second video is from Syria from October 2013. Syrian Wahhabi cleric, Omar Gharba also known as Sheikh Omar Raghba can be seen on camera smashing the statue of the Virgin Mary. The incident took place in Qunaya, a village in the northern countryside of Idlib province, the New York Times reported. Despite the Dutch embassy’s tweet, Donald Trump has remained defiant and instead got into a new diplomatic row with Britain’s Prime Minister Theresa May in response to criticism from her spokesperson for retweeting the videos.